The UCD Library Cultural Heritage Collections blog has been instrumental in bringing to life aspects of collections from across the range of our four Cultural Heritage units, which include UCD Archives, the National Folklore Collection, UCD Special Collections and UCD Digital Library. Last night this effort was recognised with a gold medal win in the Blog Awards Ireland <https://blogawardsireland.com/> Arts and Culture category. 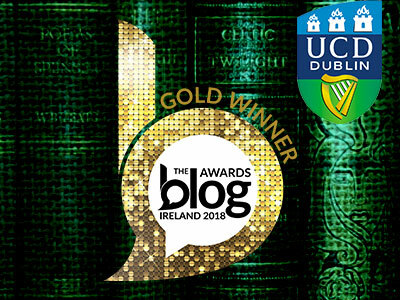 We congratulate the team behind the fortnightly posts, and especially Meadhbh Murphy of UCD Archives, the founder and main driver behind the blog’s success. View the blog, and subscribe to new posts, at https://ucdculturalheritagecollections.com.